Sorrentino’s annual Mushroom Harvest takes place the entire month of September, with feature menus, wine dinners, and special cooking classes. The Faculty of Agricultural, Life, and Environmental Sciences at the University of Alberta is hosting a free public screening of Food Evolution on September 12, 2017. It is a film about the status of food and the use of GMOs in food production. In the Spirit of Festival Place combines a fundraiser with a spirit tasting on September 14, 2017. The $65 tickets include tastes of single malts, ports and madeiras, entertainment and light appetizers. Tickets for Vignettes Does Dining’s dinner from the folks behind El Cortez, Have Mercy, and the forthcoming Holy Roller are now available for $90 each. The event takes place September 15, 2017. Last year’s Mooncake Masterclass (organized in conjunction with the Chinatown Business Improvement Area’s Moonlight Carnival) was cancelled, so it’s great to see that they’re giving it another shot. It takes place on September 16, 2017 from 1-5pm – learn how to make mooncakes in time for the Mid-Autumn Festival. Tickets are $18. Dig In, St. Albert’s horticulinary festival, runs September 19-23, 2017. The festival includes hands-on workshops and culinary walking and bike tours. Early bird tickets for the 20th edition of the Rocky Mountain Food & Wine Festival, taking place November 10-11, 2017 at the Shaw Conference Centre, are now available. The discounted admission is available until September 27. Coming soon: a Laotian restaurant called Khao + Naam. The new restaurant in the Alberta Hotel has a name: Revel Bistro & Bar. It looks like they’re targeting a September opening. Bingsu (Korean shared ice) has come to Edmonton in full force – Snowy Village is now open downtown at 11020 Jasper Avenue, to be followed by Snow Bear on September 9, 2017 just down the block at 10051 109 Street. Villa Bistro (which has since replaced Free Press Bistro at 10014 104 Street) is now open. Urbano Pizza has closed their Boardwalk location downtown, but on the plus side, Bodega will be expanding. Rogue Wave Coffee has closed its location in Queen Mary Park, but has hopes to open up in a larger space in the near future. Happy to hear Jacek is expanding their Sherwood Park location in time for the holiday season! Expect the new Experience Boutique to be open in November. Cafe Linnea is now offering prix fixe Tuesdays, 3-course meals (plus an amuse bouche) for just $30. Liane has a few more details about Farrow’s Ritchie location, namely, that they’re able to offer even more pastries. A second cat cafe will open in Edmonton this fall called Paws the Cat Cafe, just north of Downtown on 109 Street. Vue Weekly has an early review of Cargato in Forest Heights. Twyla didn’t find much to be inspired about at Bottega 104, while Cindy is still hoping for more. Jonny paid ACE Coffee Roasters a visit. Graham wasn’t impressed with the service at Situation Brewing. Cindy recapped the Taste Alberta International Street Food event that took place at Dogwood Cafe a few weeks ago. Perhaps bathrooms shouldn’t have a place in these notes, but in case you’re hoping to support our local entry, Dorinku is up for the title of Canada’s Best Restroom. You can vote for them until September 8, 2017. You may have heard of produced-based Community Supported Agriculture, but did you know it is possible to buy into a fruit-based one in Edmonton as well? Sprout Farms (an apple orchard) began a fruit share program this summer. We had a lovely family dinner at Uccellino last week. 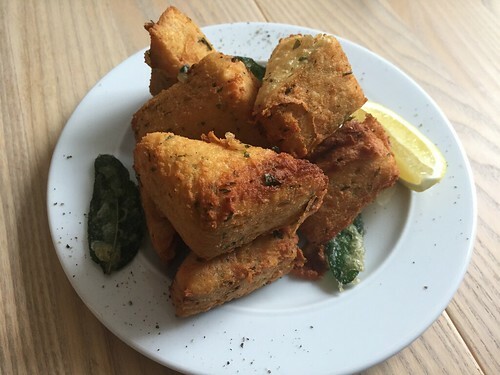 Although we enjoyed all of the dishes, the panelle di ceci (fried chickpea polenta fritters) were the surprising favourite, light and airy, and had a texture reminiscent of tofu. 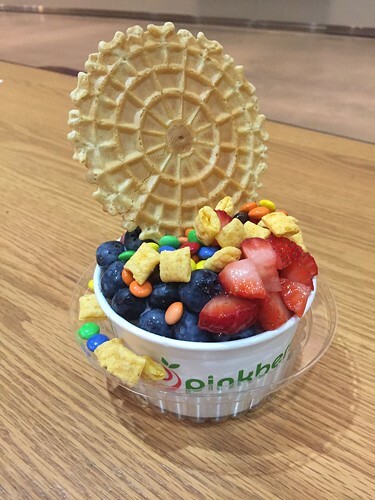 When I get a hankering for frozen yogurt, I often forget about the Pinkberry tucked away in Rogers Place. Mack and I stopped in one night last week.